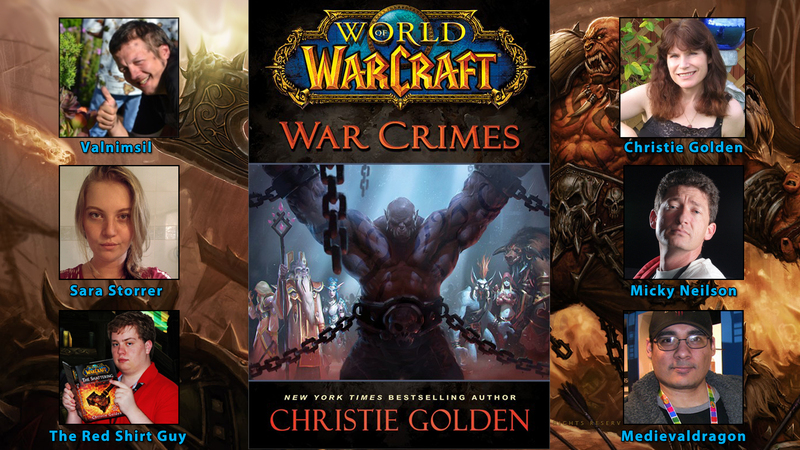 Blizzplanet had the great opportunity to chat via Skype with both New York Times best selling authors, Christie Golden and Micky Neilson (Blizzard publishing lead) to discuss details of World of Warcraft: War Crimes . This interview might have a few spoilers. ** A transcript may be found after the break. Welcome to Blizzplanet, everyone. I'm Medievaldragon. Today we are interviewing New York Times best selling authors Christie Golden and Micky Neilson (Blizzard publishing lead). We'll ask questions about World of Warcraft: War Crimes. Among the interviewers are Blizzplanet staff members: Valnimsil, Sara Storrer and Ian Bates (alson known as The Red Shirt Guy). We'll now begin with the first question. Could you describe the first phone call from Blizzard asking you to to write War Crimes? I think it was email actually. We usually communicate through email; and I do remember (I believe) -- Micky you sent that one to me, and they told me the idea that they wanted me to do and they said they wanted to work with me on developing the outline. Sometimes the outline comes complete from Blizzard and sometimes we all get together and kind of hash it out and this time we were getting together to hash it out; and I remember thinking: "Wow! This is a really, really cool idea." I don’t know of anything like this that has been done before and I was just very excited because I knew it would be an aweful lot of interesting possibilities and threads and story ideas. Can you discuss who plays the role of defender and prosecutor, and why you chose these two? We have Baine with the thankless task of trying to defend Garrosh and we end up with having Tyrande being essentially prosecution which is accuser in the terminology that we use for the book; and it was a little sneaky of the Alliance. They originally fronted Varian; and Varian got vetoed so then they were able to get Tyrande who was going to be much more, I think, hard-nosed than Varian, at least the Varian as he is now (would have been). So the Horde might have done better to have stuck with Varian. Sometime ago you mentioned this story isn't about Garrosh. Who are the central focus of War Crimes and why? You know I think if you want to take the big scope (which is what of course the celestials are doing), it is not just Garrosh. It is everybody. And the point of the trial is for many, many story arcs are wrapped up here or examined and gently laid to rest; and a lot of people go on their own journeys here, so it is not just Garrosh who is one of the main characters. It’s several characters that we have followed for many, many years; and this trial pretty much brings out all the skeletons in the closet and all the ways of looking at things. So my hope was that it would feel like a journey of not just the one character. Not just the main character that is on trial; and I think the cover art was brilliantly designed to reflect that. That’s one of the best covers I think I have ever seen; and it does such a great job of setting the stage to the fact that this is a multi-character book with many different arcs. Did Blizzard's Creative team pitch some ideas to you? Did you bounce ideas back? Was there a brainstorm session to build the blocks that shaped War Crimes? The basic idea was conceived by Blizzard and Micky has an interesting back story angle on that so I will let him take this one. Yeah, so it was me, Metzen and Dave Kosak just sitting in Metzen’s office; and trying to figure out what the story for the next bridge novel would be; and we talked about all kinds of things. One of the things we talked about was Garrosh being kind of hunted down, tracked down by Varian and Thrall; and in that scenario he wasn’t in chains. He wasn’t captured. He was loose. Then, we kept talking, and we explored more ideas; and we thought: "Ok. What if he is captured? He has not escaped. And what if we built a book around the trial that is taking place; and the more we talked about that, the more we got excited about it; because we realized that [that] was something that had not really been done anywhere that we could think of. Especially the way we started to talk about executing on that; and once we had that premise in place, then we contacted Christie and brought Christie on; because we knew that she would do a fantastic job. Especially, because this is so built around the characters; and Christie ... you can take it from there. That pretty much sums it up. We got to do one of my favourite things in life, which is to hang out at Blizzard HQ and have a great jam session with some extremely creative minds. I love that. I love getting to interact with the Blizz-folks and pounding out these ideas and it is just so exciting to in retrospect to look back on those meetings and say: "Yea, I remember when Chris had the idea of this; or Micky said this; or Dave told us about this quest chain:" and so it was great. It is always fun to sit down and co-create with Blizzard. Awesome. So, Christie, My question for you is: How was it decided that a trial was the best approach to introduce Warlords of Draenor? It wasn’t necessarily that it would be the best way to represent Warlords as much as it was an opportunity to answer several questions and set up Warlords. So we knew by the end of the book (and I won’t give anything away for people who haven’t read it) but we knew what the ending of the book was going to be; and we knew that the ending of the book was going to set up where players are going to be going in the game. So in the meantime, though, we had an opportunity to really dig into several marquee characters, and to take a look back at kind of how we have all gotten here; and everything that Garrosh has done; and kind of remind people who Garrosh is and why he does what he does; and thinks the way he thinks; and we were also able to explore a fantastic theme in the book, which is that even though Garrosh is certainly guilty of all these many crimes, no one is innocent. So it was a way to really dig into that theme which we were all very excited about. How did you keep the story coherent with so many characters and historical moments? That is a great question; because there are a lot of things we wanted to say and showcase and I have done a multi-character book before with "The Shattering " ... was my first effort to do that with a Warcraft book; and so, one of the things I actually did, because as a writer you want everything to have good pacing and good balance ... so one of the things I did was actually get out index cards (good old color index cards); and each color was a different plot thread, and I laid them out on my dining room table so I could see when it was time to shift the attention to one thread and make sure that everything was moving on together as it were, so yes that was a big challenge for me. One of the highlights of the novel for many people are the flashbacks that we see via the Vision of Time. Were there any scenes or flashbacks that you wanted to or had planned to include but got cut for whatever reason? I don’t think there is anything that got cut, but initially -- you know, WoW is so much to choose from; so I let the charges that were levered against Garrosh (which come from actual charges, and where we got the term crimes against humanity was of course Nuremburg); and I let the charges dictate which scenes came. I wanted to make sure I had something really striking and griping and dramatic for each of the charges that were levied against Garrosh; and so at the beginning, it was kind of like an embarrassment of riches; but once I had a guideline which was: "Does this serve the theme of war crimes? "; then it became a lot easier to narrow down especifically what scenes to pick. There is a scene where Garrosh kills Krom'gar in Stonetalon Mountains for bombing the druids. Yet, Garrosh bombs Theramore, and he at least is given the right to have a trial. There is an irony somewhere in there. What was your motivation to use that scene in the trial? The whole bombing of Theremore was really striking to me because we have a scene actually in-game where Garrosh punishes, indeed kills, somebody for doing pretty much exactly what he ends up doing; and the contrast between the Garrosh-then and the Garrosh-now; and especially also of how deeply profoundly that affected, that wiped a whole city off the map. That’s a big deal; and so again, we are looking for things that do double duties. So to be able to compare Garrosh’ actions before and then currently with Jaina; and how it affected her, as well as everybody else who was involved in Theramore -- the repercussions of that, that was a really key scene; and that was one of the things we did know we had to have in the book. Zaela, Shokia, Thalen and Harrowmeiser make a great villain team, and were one of the most pleasant surprises in War Crimes. Do you think we'll see more of them, either in you're own writings or in-game? Well, I certainly had a blast writing them. You know, it was actually comic relief. You put a goblin in, and you are going to have a laugh. So I love writing goblin dialogue. I gathered them. I had some suggestions from Blizzard, and then I actually ran across Harrowmeiser in-game; and I was like: "I have got to put him in." So they were a great foursome; and such a differing personalities. I would be more than happy to work with them again. I don’t know about anything coming down the pipe for sure; but I certainly enjoyed writing those scenes. I have a question from Noitora, who sent us this: What could you say about the conflict between Garrosh, Sylvanas and Genn Greymane concerning the nation of Gilneas? Yea, that was one of the plot threads that we did not feel helped the main storyline; which was the trial, as well as character development, as well as etc. and so forth. This book could have been huge, if we had wanted to, we could have addressed so many different plot threads and storylines; and so it was hard picking and choosing. Certainly for some of the crimes that he was charged with you could find 5 different examples of it, for instance. We really tried to just narrow things to certain characters and certain events that we thought would really serve the book best and that was unfortunately one of the plot threads that we decided early on not to pursue. Tyrande lists several War Crime charges against Garrosh. Could you discuss some of them? Let’s see off the top of my head they are listed in one of the excerpts: Forcible movement of population, the kidnapping of children, genocide, targeting sites that were not seen as military necessities for war, forced pregnancy (was a big one and very hot topic when that came out). So yeah, there is 10 of them and they are all real world crimes that we did see reflections of in-game. Awesome to hear. So, Baine Bloodhoof has been a key character in most of your recent Warcraft novels since "The Shattering", and onward. Have you grown attached to Baine on a personal level? I am very fond of Baine. When I started working with him in "The Shattering," he really didn't have that much character development. We knew his backstory; but we didn’t really have a personality for him other than you assumed he would be a pretty cool guy; because we knew Cairne, and Cairne was a cool guy. So I really got to develop his personality and figured out a voice that I could listen to when I was writing for him and so I have really become very fond of him and I identify a lot with him with the loss of his father; and I think he is what I like to call in a book "a good travelling companion." I believe when you are reading a book you are almost on a journey with the characters and you want to have good travelling companions. They don’t necessarily have to be the best people in the whole world; but they have to be comfortable and entertaining and I think Baine serves that purpose. At one point during the trial, Tyrande requests the removal of Baine from the case. How far is Tyrande willing to go in order to win? And, are there any immediate or future repercussions with her tactics as the accuser? I think Tyrande as evidenced by what she did in that particular scene that you referenced, she wants Garrosh dead and she has been charged with doing, just as Baine has been, doing the very best she can to make sure that this orc receives what she and many others perceive as the only ... the ONLY real justice. Everything else to her would just be ridiculous; and so I do not think she would stoop to anything illegal or immoral; but if it is there, she is going to use it; and she is also prepared to see that from Baine. So I won’t say she will stop at nothing; but I think she will use every tool in her kit to make sure that she gets the verdict that she wants. How do you feel about "time travel" and other dimensions in Warcraft; and the implications from the lore perspective? Micky, I am going to let you field that; because I basically follow what Blizzard tells me on this. When you are dealing with time travel (because it is all theoretical) there are many different ways you can go; but I think Micky is better equipped to speak on that. It is certainly something that we have dealt with before. It is not new for this book. Christie wrote about it, and had a fantastic time kinda playing around with the different timeways and Nozdormu, and everything else; and of course, in the game you have got the Caverns of Time. So it is something that can be a lot of fun. It can be very challenging; and of course, the biggest questions that come up when you are dealing with those kinds of things are, you know: "Are we dealing with going back into real history?" ... "Are we talking about an alternate timeline that we are going into?" ... "If so, what are the differences in the alternate versus the real?" And so, I just want to say to everybody: (I don’t want to give too much away; but...) if you read the book, there are some answers in there and then also we are going to be doing a short story that is going to be put up for free on the website for everybody to read. So for people who have questions specifically about time travel issues, if you read the book and you read the short story, you should get those questions answered. This one is ... I'm going to make it as spoiler-free as possible ... The August Celestial's verdict (without giving it away) is quite odd, considering what Garrosh has done and we know he is going to do in "Warlords of Draenor". Do you think they will regret their decision? -- the Celestials, once we find out about the Iron Horde. Or can they see into the future? ... like some people have theorized. Or do they want him to go to Draenor? We can’t really comprehend how they think, and I won’t go so far as to say they see the future; because I honestly don’t know one way or the other; but I do think that they are wiser than we are and they are unburdened by things that we are. So they are actually as impartial as impartial can be. ... Like how the destruction of the veil ended up helping the pandaren in the long run. Exactly. We are mortals, and most of us in Warcraft, most of the races are short-lived. They are not thousands of years old. Some of them are, but not all of them; and they are very immediate and these are infinite creatures; and I think they see all ends, and what may seem very frustrating may turn out to be: "Ooooh ... got it!" But that is not based on anything that I know of Warlords. That’s just my take on the characters. Micky, do you want to chime in? Yea, I'd just say that-- you know ... We as mortals are short-sighted. They are not. So they have a much bigger picture, and they have that wisdom. So even if it is not necessarily a matter of being able to... look into a crystal ball and see what is going to happen 100 years from now, they still have the long view; and that is built on the wisdom that they have accumulated over their lifetimes. Yea, I'd just say that-- you know ... We as mortals are short-sighted. They are not. So they have a much bigger picture, and Do any of you guys have more questions? I do have one comment I want to make. Again, thank you so much for this opportunity. Christie, you did an amazing job with this. Once again, and Micky and Lindsy... you guys are doing an amazing job over there, as well. So once again, thank you guys so much for this. I have one question. It was interesting how Thalen got revisited; but will we ever find out exactly what happened to Aethas and the rest of the Sunreavers? Patch 5.2 looked like it was building up to something, and there have been some talks about deleted content, from sources; but we don’t really have an answer to what exactly Aethas was doing, and this would have been a good time to bring it up. Was that considered? That is a Micky question. Yea, I don’t believe-- I don't remember in the discussions that we had for the book that we had talked about Aethas, and I can’t speak of anything coming up game-wise; but I don’t think so, Christie we didn’t have those discussions when we brought you in did we? No, that was one of the plot threads we decided not to pursue. It would be a good source for future action conflict. Lot of people want to KNOW. The previous expansions, there has usually been two different novels to introduce the expansion. Are we going to see a new book some time in the next months? Ahh, we don't have anything to announce as far as a new book at this time, just the short story that I was talking about earlier that would go up for free in the website. I would suggest that people read it; because there is so many characters and so many references to the history, that it is going to be pretty a good refresher just kinda on who the Alliance and the Horde are, and were; and hopefully, are going to be. I think also it is a chance to hang out with some of your favorite NPCs, and hopefully it is interesting philosophy conversation that you can have. **Tips: Ian Bates referenced Patch 5.2 Isle of Thunder, concerning Aethas Sunreaver and the Sunreavers (former Dalaran’s Blood Elf faction). The Patch 5.2 questline can be viewed in our collection of quest text, images and videos. Read my review of World of Warcraft: War Crimes. Special thanks to the Scrolls of Lore community for some of the questions, and to Lucy for the transcript. Other fansites and influencers with a War Crimes interview.